Minister of Environment and Energy since November 2016. Previously he served as Minister of Economy, Development and Tourism (September 2015 – November 2016), Minister of Economy, Infrastructure, Maritime Affairs and Tourism (January 2015-August 2015). 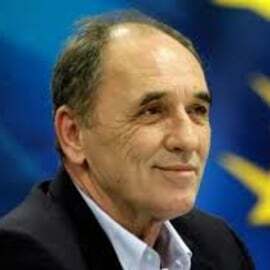 Member of the Parliament with the SYRIZA Party since 2012. Professor of Political Economy at the University of Crete (1988-2012) and also Visiting Professor at the Centre of European Studies, Harvard University and at the Centre for Byzantine and Modern Greek Studies, City University of New York. He studied Economics at the Athens University of Economics and Business and holds a PhD in Economics from Newcastle University, U.K.